it’s been almost 2 weeks since Little Foot fell ill. So one day, I woke up and found myself with a crabby feverish toddler, who was already very clingy since she started school, and starting to display terrible two behaviour. 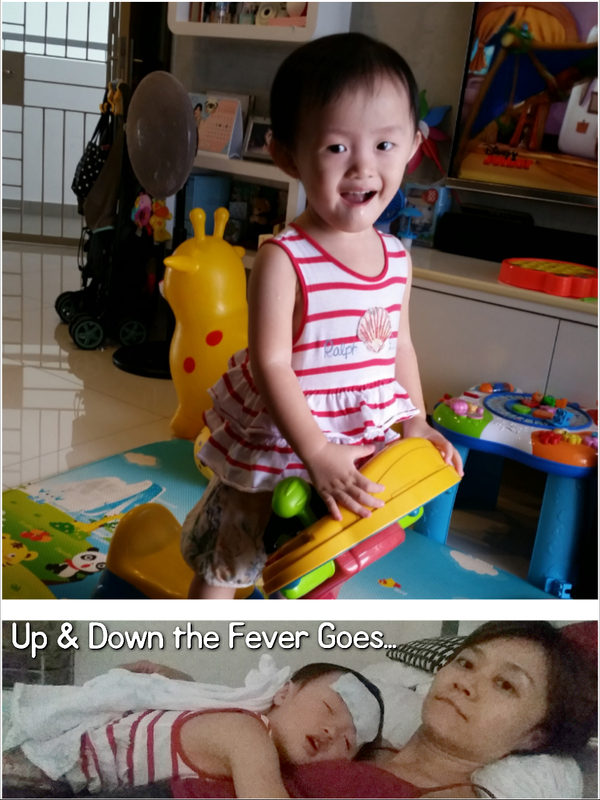 We battled 9 days of fever bouts, somewhat like a roller coaster… with three visits to the PD. There were the days when Papa couldn’t be there (and couldn’t handover the car), so we took cab. PD finally found out from the blood tests that it was mycoplasma infection (it sounds more horrible than it really is). Saying I was worried & emotionally exhausted felt like the understatement of the year. 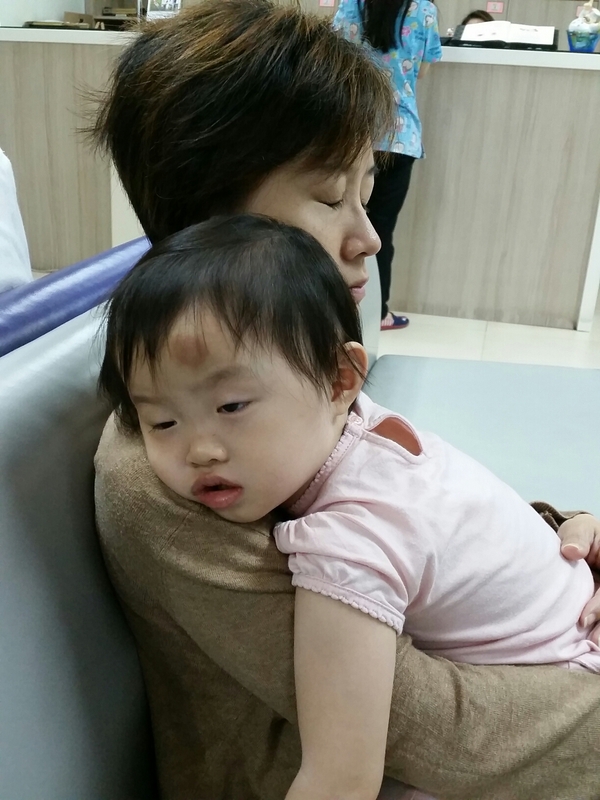 Poor Little Foot had to endure all the medicine sessions, had to be disappointed when we say no, she can’t go out to play with the next door korkor and meimei. She had no appetite, rejected her milk bottles. She just wanted to keep directly latching (God knows how much milk I have left in me!). And then there were all her tantrums, brought on by the discomfort from the bug. On three occasions, I lost my cool and shouted at her. And then there were the “test my boundary” antics. She got a smacking on the calf from me for purposely pouring the green tea bottle contents all over the floor. AND she was super clingy to me. 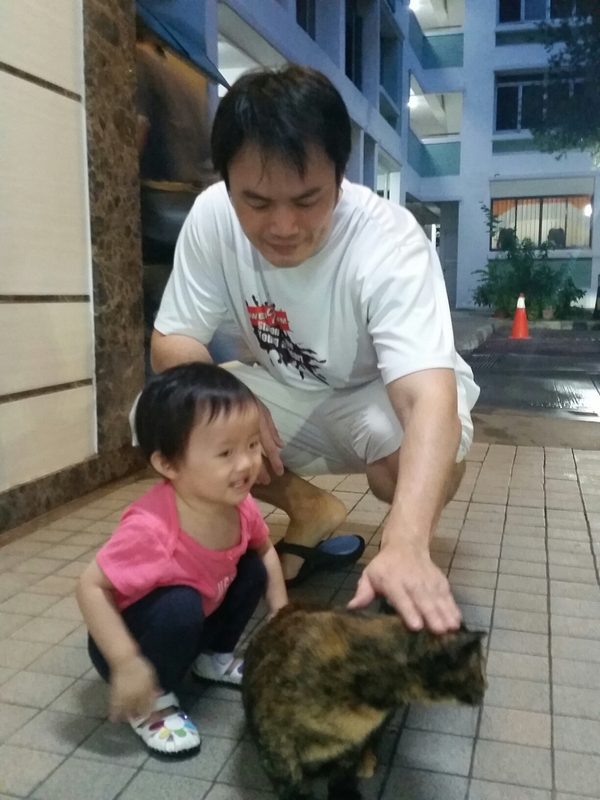 I took leave to bring her to the doctor, ran home when the fever persisted. Every moment I was in the same space physically, she wanted to make sure I was in line of sight and preferred to plaster herself to me, or act like a baby koala. As I described to my friends, her love really overwhelmed me. There were moments in the last 2 weeks that I wished I could return to life before baby (I hear some exclamations of “Nooo…no good mamas ever say that! ” but Harlow, I am human). 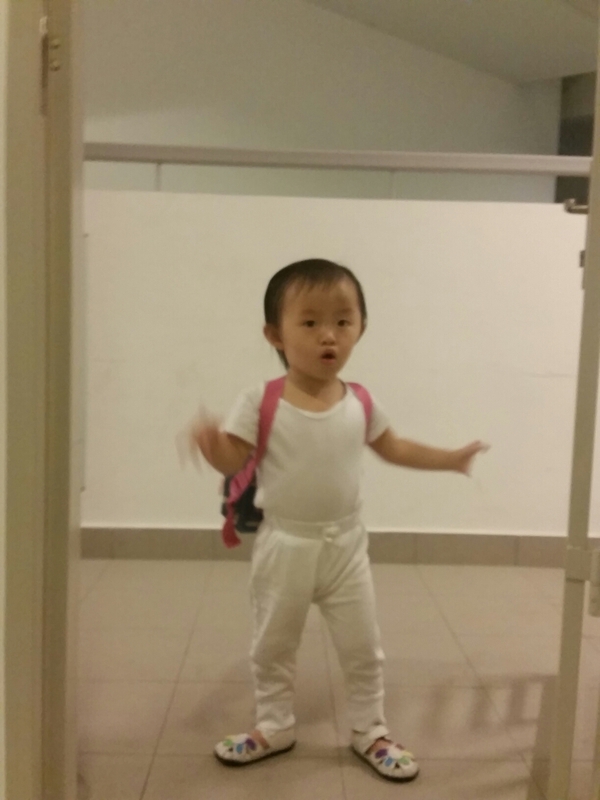 The banging outside the toilet door with her calling put “MAMEEE…. MAMEEE….!! !” would jolt me back to reality. Thankfully, there were also pockets of funny, cute or heartmelting moments from her which would smack any wish for my old life back out of my head. Just give her a little while more, because one day, she won’t want or need me like this anymore. Then, I will miss my little no. 1 fan. 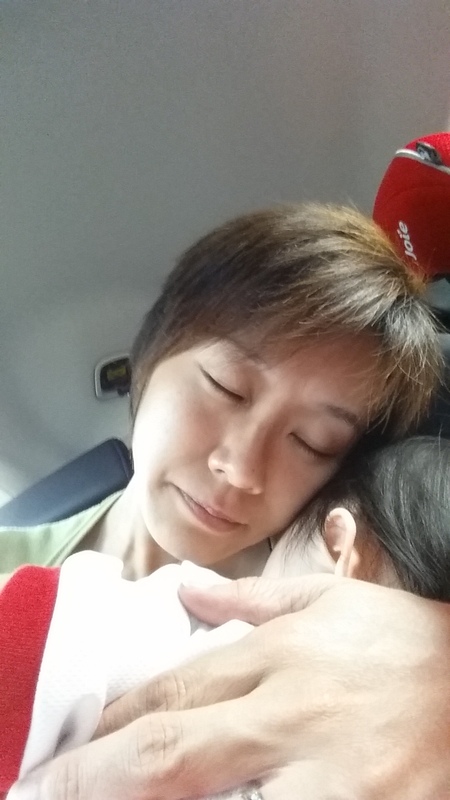 Then, I wouldn’t regret that I didn’t hold her just a while longer and a hug her a tad tighter. The fever finally went away since Saturday, and she’s on the road to recovery. This week, Little Foot went back to school. 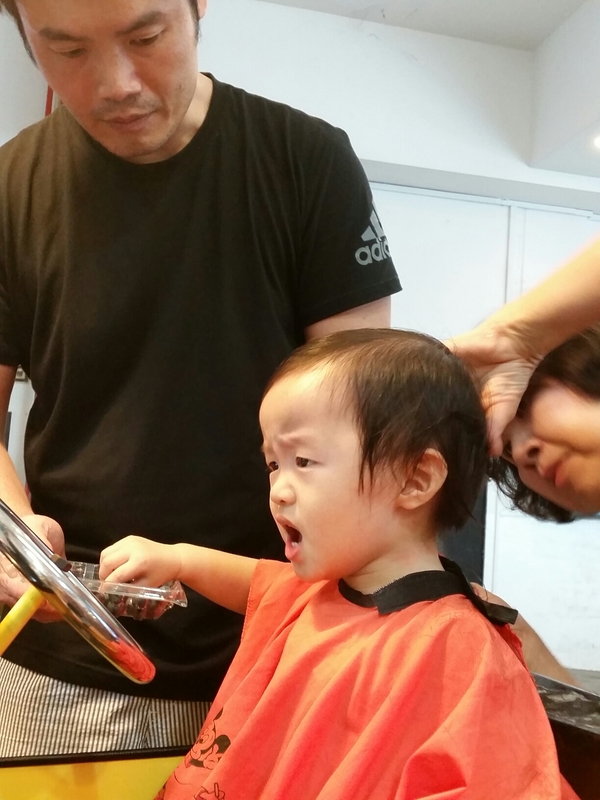 After such a long break, we had to start the adjustment all over again…. yet again, she is clinging madly to me, and would randomly cry for no reason. Emo! Let’s hope things get better…. while my heart and my sanity is being tested day after day. P.s. as I looked through my photo gallery, I realised that we did manage to get some very nice activities done during the moments when the fever was at bay. I’m glad we tried to keep her happy and entertained meaningfully. It really takes a lot of courage and conviction to be a parent, and I am still being trained and tested everyday. Parenthood really is a lifetime project filled with flying spanners and fireworks. With the benefit of hindsight, it is a good thing that we took a long long time deliberating whether that parenthood would be our kind of gig, so we can’t really say we jumped in blindly. Everytime I feel like I am running on empty, I remind myself that we agreed to hold hands and take this leap of faith together, and that come what may, we will always try to be the best that we can be for our child. 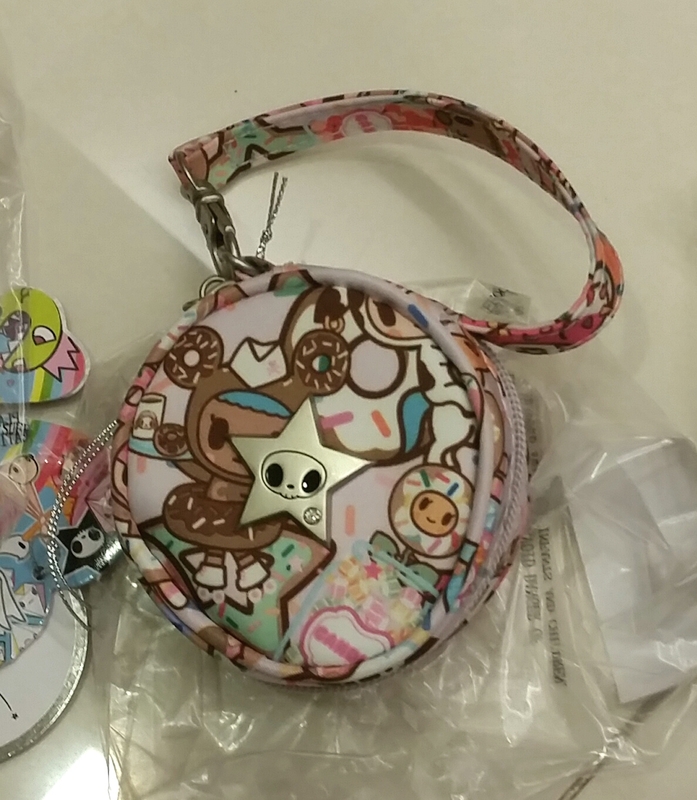 Mummy Joyc has been a huge huge fan of Ju-ju-be bags since last year, especially the ones in Tokidoki prints. 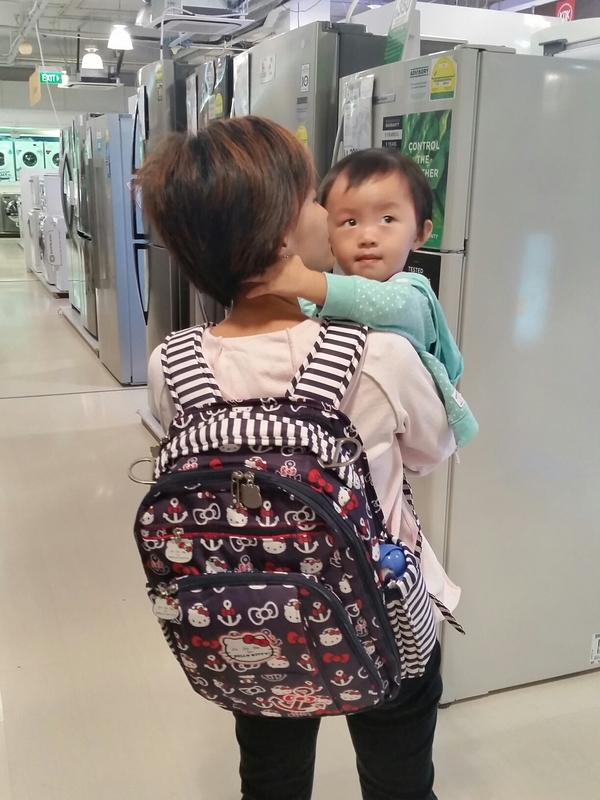 Currently, this seems to be one of the hottest diaper bags brand among mummies thanks to the cute prints and the wide range of different sizes. And we love how the whole bag is machine washable. During the latest release of Donutella’s Sweet Shop, lucky Mummy Joyc managed to purchase quite a few items of the pinky pink series. The angels were smiling on us! So to spread the love, A Little Footprint, will give away this brand new little item called a pacipod to one lucky person. Some mamas have asked me what I put in a pacipod since Little Foot doesn’t use a pacifier. There are many uses for it – for me, I keep my earphones in one of these. Sometimes we also use it to store a few of Little Foot’s finger puppets when we are out. It’s a neat accessory for days when I’m not carrying a Ju-ju-be Bag, but want other mummies to know I am a Pink Lady! Pop over to A Little Footprint Facebook page for the contest. An answer to the contest question is found on this blog! Participation closes on 30 July 2016 at 12pm. A Little Footprint is not affiliated in anyway to Ju-ju-be. 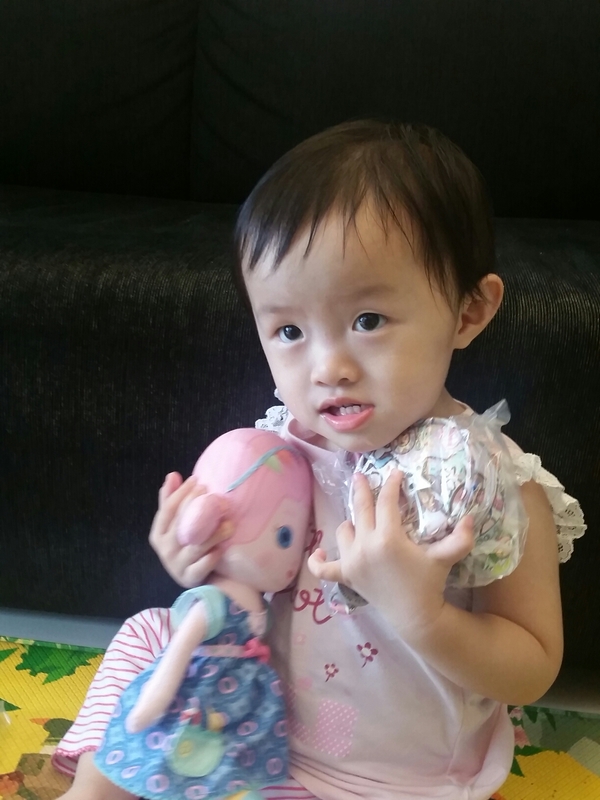 This free giveaway is paid out of Mummy Joyc’s pocket, because Mummy thinks a little love can go a long long way. Winner will be randomly drawn (using some neat online system of course! ). Winner to pay for postage / arrange to collect the pacipod at Mummy’s convenience. Winner will be announced on the Facebook Page on 31 July 2016. We can’t stop you from selling the pacipod for a profit, but we really hope this will go to a mummy and baby who genuinely loves it and want to use it. Thanks for popping by A Little Footprint. 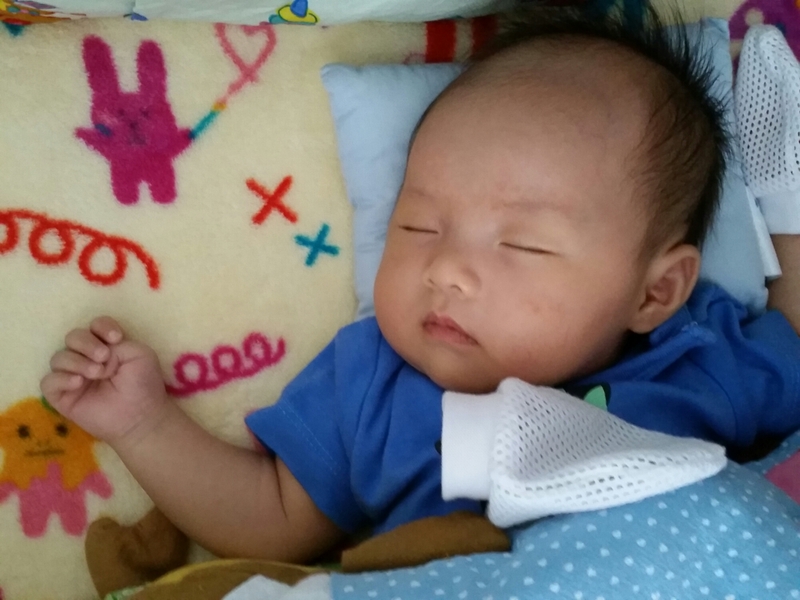 This is a no-sponsorship blog owned by Mummy Joyc sharing stories of the ups & downs of Parenthood and Marriage as she goes on this life – changing journey together with Papa Long and Little Foot. We hope you enjoy reading our blog! We’ve picked a winner through a List Randomizer. 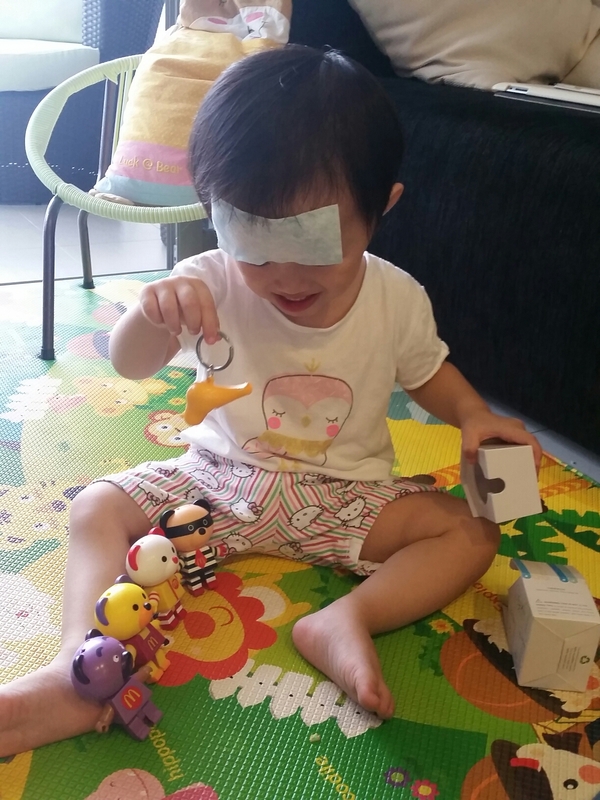 Congratulations to Jessie Phua for taking part in the contest. We hope everyone will still stick around and like us on Facebook and WordPress! Little Foot has been having high fever the last 2 nights. Thankfully, the fever has gone away somewhat so she was able to resume her routine of going downstairs. We were mindful not to go near the other kids though, as the bug is still hanging around us. Enthusiastic about bringing the new Skate Scooter out for the first time! Papa was home in time for a “cat hunt” session with Little Foot, even though it wasn’t Sunday. Here’s a marmalade coloured stray cat. So pretty! Our outgoing Little Foot, didn’t wanna stay home after her bath! 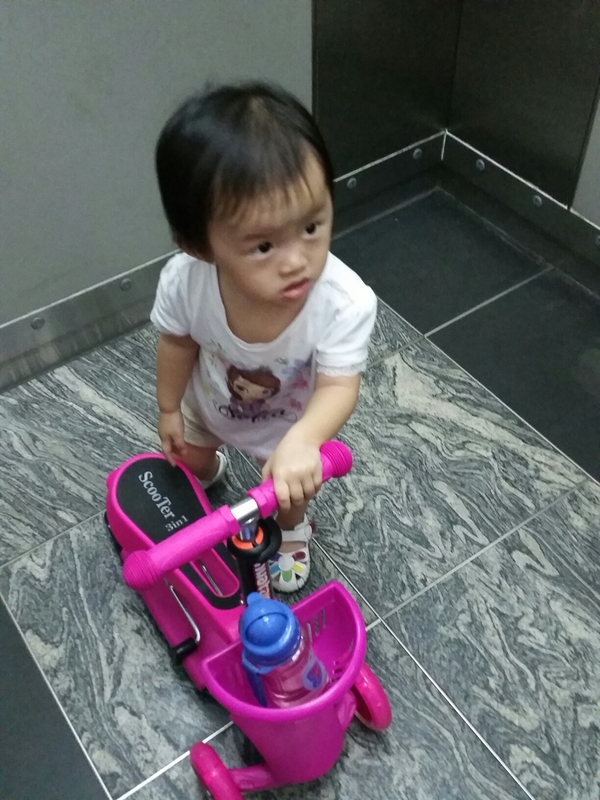 So we walked around the corridor for awhile before bedtime. Get well soon baby, all the above pics sure beats that situation at the PD yesterday when you kept dozing off from the high fever. Inside, Mummy was panicking! I’m glad you are such an outdoorsy girl…. 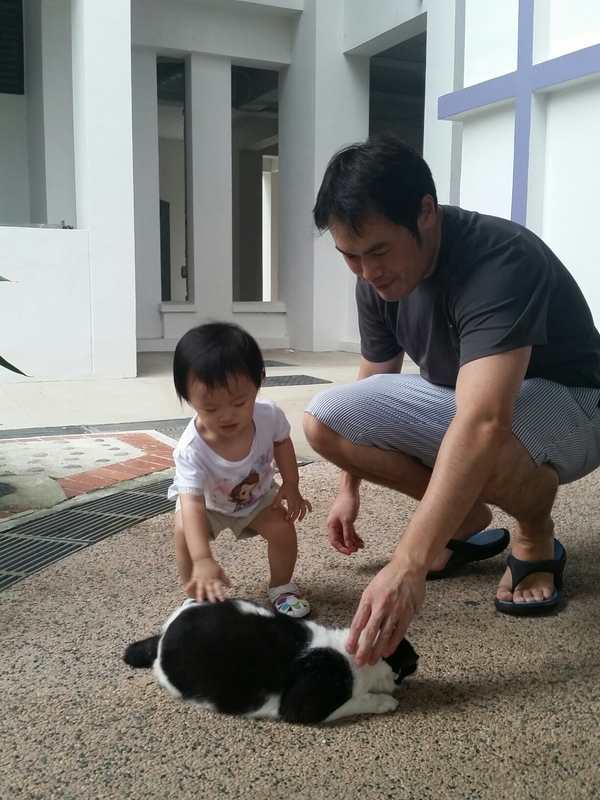 and also glad Papa has taught you well when it comes to loving animals. Day 5 of school; Day 3 of leaving her with the teachers. Dropping Little Foot off is becoming more tricky, obviously the baby knew what was coming — Mummy was going to pass her to someone and walk out. 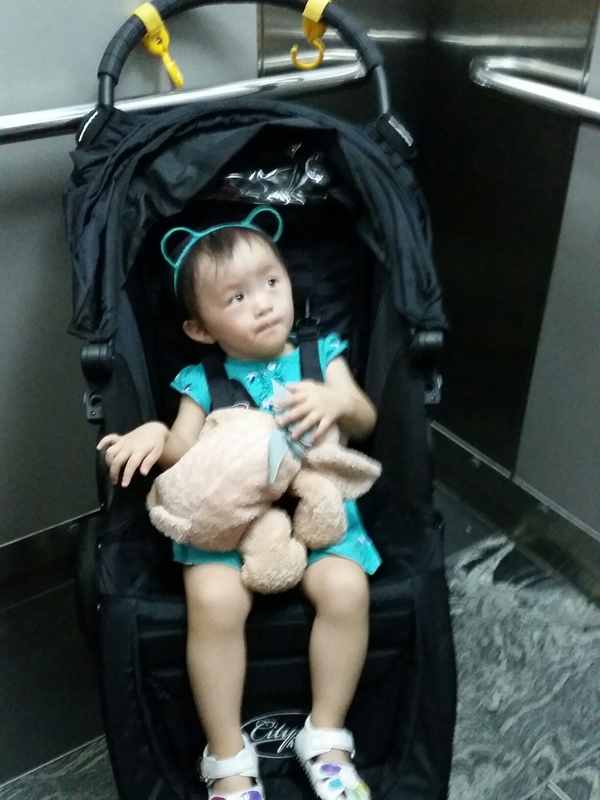 She insisted on carrying her backpack (bear bear!) and her toy dog (Ah-Ah!) around the class, refused to lose bodily contact with me. In a last ditch attempt to reject this arrangement, she packed her items, held my hand and walked to the shoe cubbyhole, took out her shoes sat down and attempted to wear them. A clear signal to Mummy to “lets get outta here”. Heartbroken to see her in this state. I stayed with her as we waited for familiar faces to arrive (Gong 老师 has taken ill, and the other two teachers were not in so early). By 9am, it was clear I was going to have to really move off. So I did. Poor Little Foot cried big tears. Seriously distressed. More playtime, Barney, books, anything she wanted to do, she was free to roam around the house. Breaking her free spirit, breaking this old routine is heart-wrenching for me. My 19-month-old doesn’t quite understand why there needs to be this change, and she certainly didn’t see anything wrong with the old routine, where she made all the little decisions – what clothes to wear, what shoes to wear, which toys she will pick from the boxes and cupboards, when it is a good time to have some biscuits or bread… which room she will explore in the house. My 10 minute walk ended. 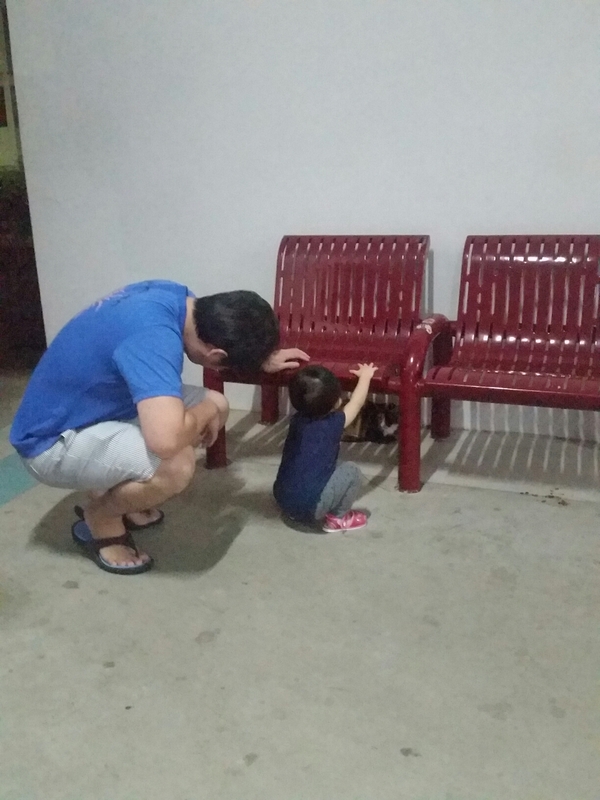 I needed to shake the sinking feeling that was creeping into my soul, lift up my chin and console myself that it will get better, she will like her new friends and new routine soon, and hey, it’s only 3 hours more to go before I go pick her up again during my lunch time. Back to work, back to emails. Little Foot’s sad face still imprinted in my memory. 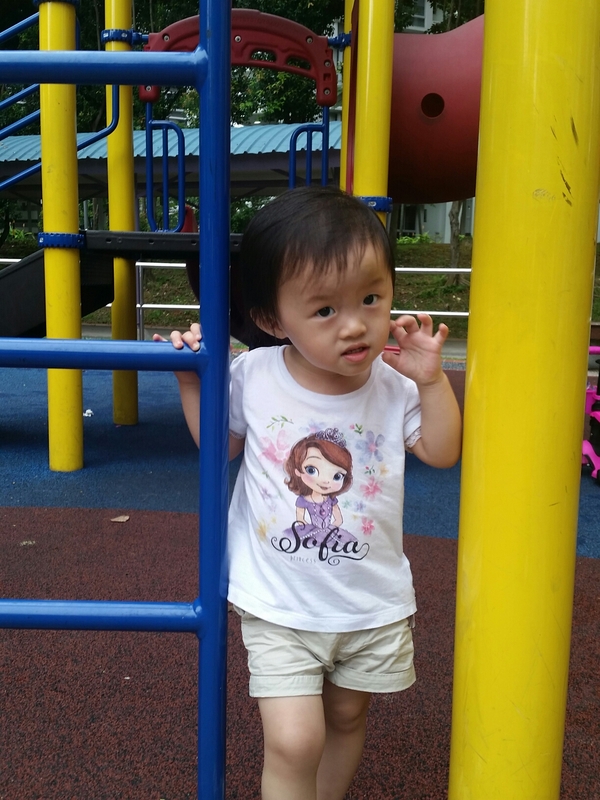 Juxtaposed with the funny situation last night when she decided to climb out of bed to go on a night adventure to the playground – she’d chose a dress, packed her little bag, wore her shoes, opened the gate and walked out. Mummy feels like a broken person. 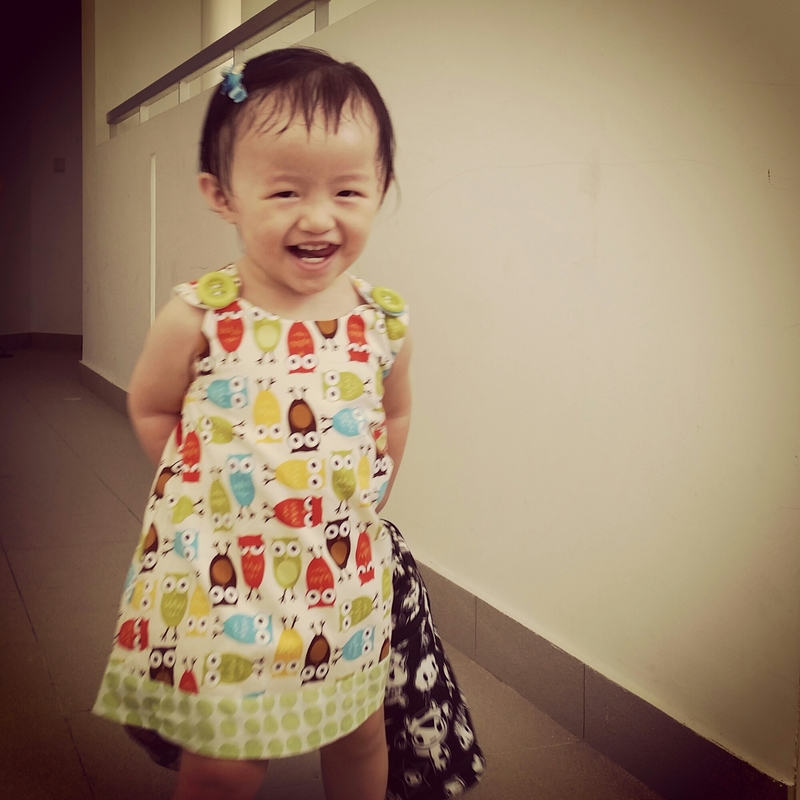 Day 3 of school… Little Foot was all dressed for Hari Raya celebrations. And she decided that Ah-Ah the dog will be her companion for the day. As agreed with Papa Long, today would be the day we exited from class and really let her adjust. We left shortly after she has breakfast and was settled down on the rug with the Chinese teacher. I had to walk out fast, more so that I wouldn’t crumble and decide to stay (that’s what happened yesterday). 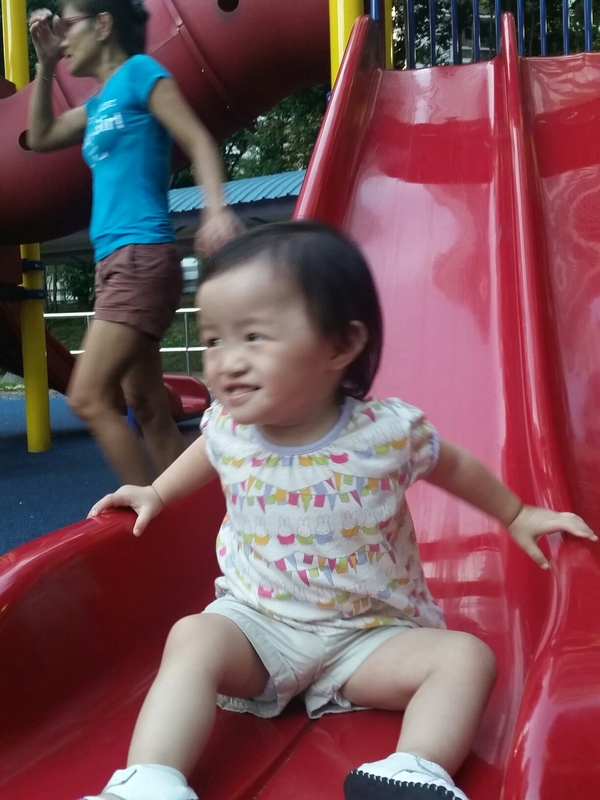 My heart was pounding… I know my Little Foot was a brave one, but leaving my 19-month-old firstborn with people she still didn’t quite knew. I know it would be just too much for her. I had breakfast with Papa and my friend (her son goes to the same school too)… and we waited. 1020am. I can’t take it anymore! Dragged Papa back to the school to peep. My heart broke into a million pieces as I stood outside the door. I didn’t need to peep… I recognised my baby pie’s voice straightaway. 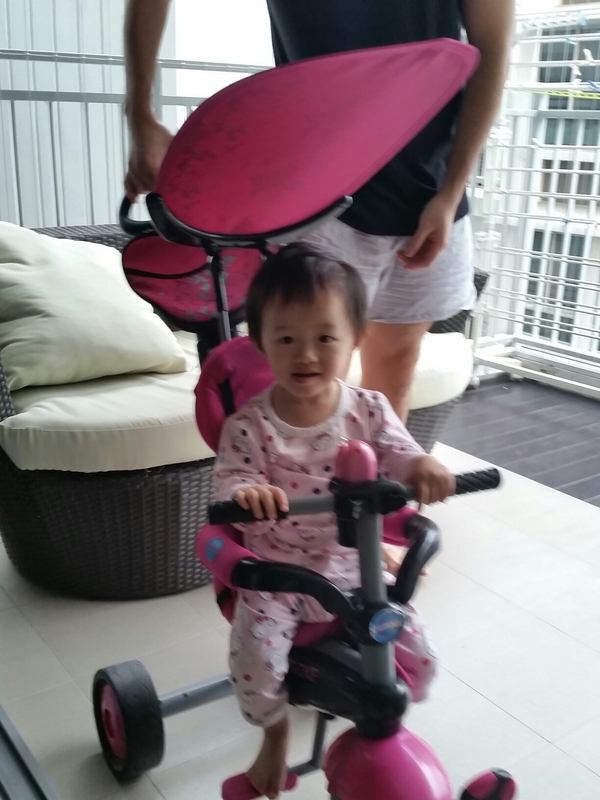 She’s not a loud bawler….there was another new toddler crying and tearing the house down. In between I heard Little Foot’s cries and whimpers. Nothing, no amount of prep talks, no amount of moral support from everyone around me can prepare me for this moment. Baby, you were crying in there and mummy’s tears were flowing inside my heart. Mummy was desperately trying to look brave and normal. Papa was firm. No, she has to get used to it. I know… I know…. the theories are easy. Doing it was hard. The same baby I have carried so close to my heart day after day is crying for me. Finally we were reunited after diaper change time and it was meals time. Instead I carried her back into the classroom. I wanted to feed her, she wanted to latch. So afraid mama will disappear again. So in need of comfort. So we gave up after 3 spoons of porridge and said goodbye to everyone. Still holding back my tears, still having to sound positive and encourage her that school wasn’t so bad, still telling her “no no…” not allowed to nurse her. Finally in the car. Yay! We survived! She finally got to the milk source. I finally dropped my plastic face. And I silently broke down as I held her and stared at the skies. And this is how it is to really say goodbye to babyhood. I remind myself, for my Dec baby, I have to grit my teeth and do this now, or her learning curve at N1 would be even more uphill if she has to also deal with the adjustments to being in the system. Nobody said it was easy. Nobody told me it would be this hard either. Little Foot had fun, and what a show-off she was when Mimi Cat made a guest appearance! (we arranged for my Aunt to bring her very tame ragdoll to the playdate for a cat immersion session as my Aunt lived just downstairs from the mummy host). 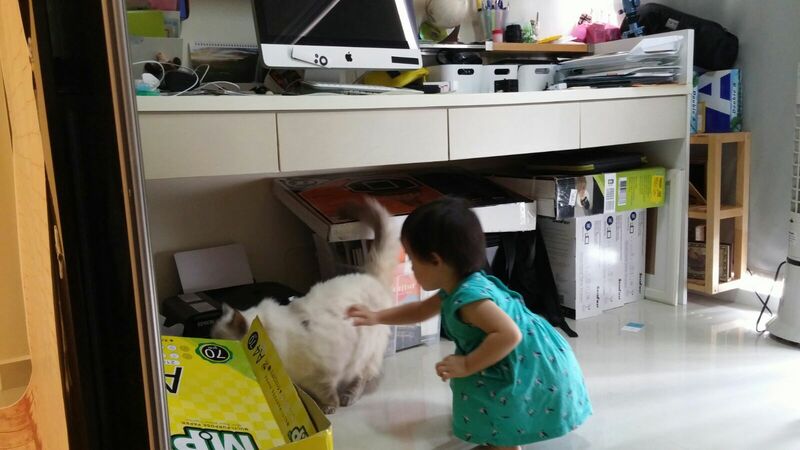 Our little lady jauntily went over and sayanged Mimi cat the moment the cat arrived. 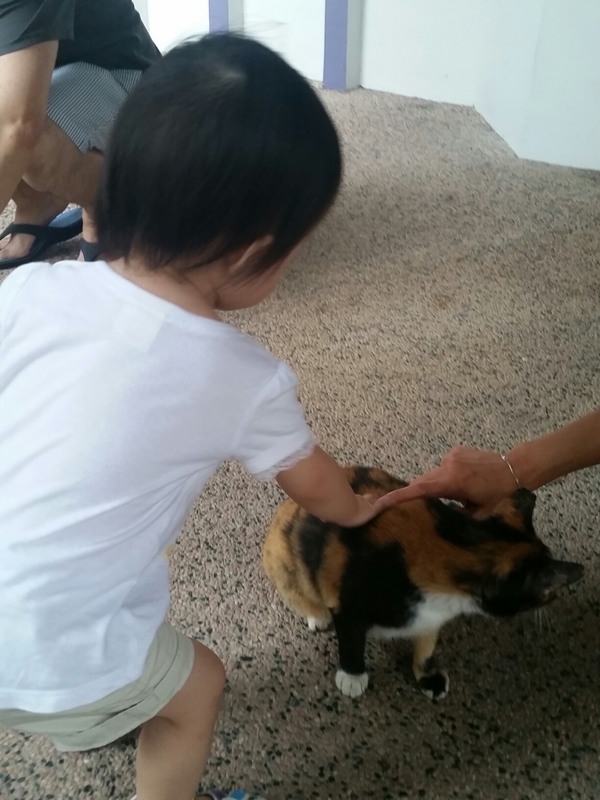 Haha… she felt the need to stake ownership (“this cat is my friend!”). As I watched her play and interact with Mimi and the other toddlers – busying herself shifting toys around, I caught moments of her giving give hearty laughs (covering her mouth) whenever the adults guffawed at something funny in our adult conversations – I told myself, I really wouldn’t give this up for anything in the world. Watching Little Foot grow, chronicling her milestones has brought me a lot of joy… even if it really meant I am going to be sleep deprived for a long long time. Even if it meant my progression career-wise may have slowed down. Her ” ha ha ha!” really works like vitamins for me, and it knocked sense into me. THIS is what is important. I wouldn’t miss this for the world. Baby, you have made me laugh my loudest laughs, cry my most heart-aching cries. Because of you, because you are with me, because you are ours, I can feel I am truly alive, and living a life beyond work work work, shop shop shop, party party party. And I thank Papa Long, for teaching her to be this animal-loving and “steady” baby who loves the animals and the outdoors. 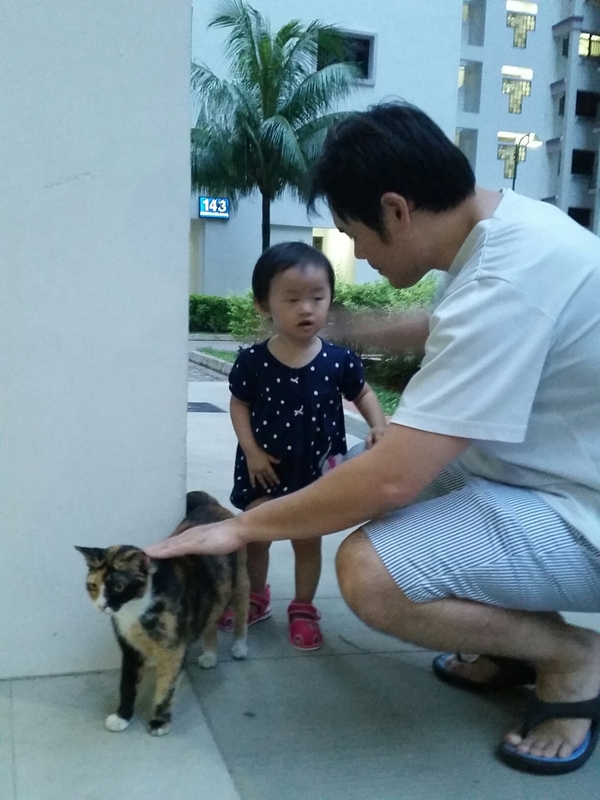 Yup, ‘cos Papa was a Kampung Kia and he hopes she will inherit his love for being on the wild side. 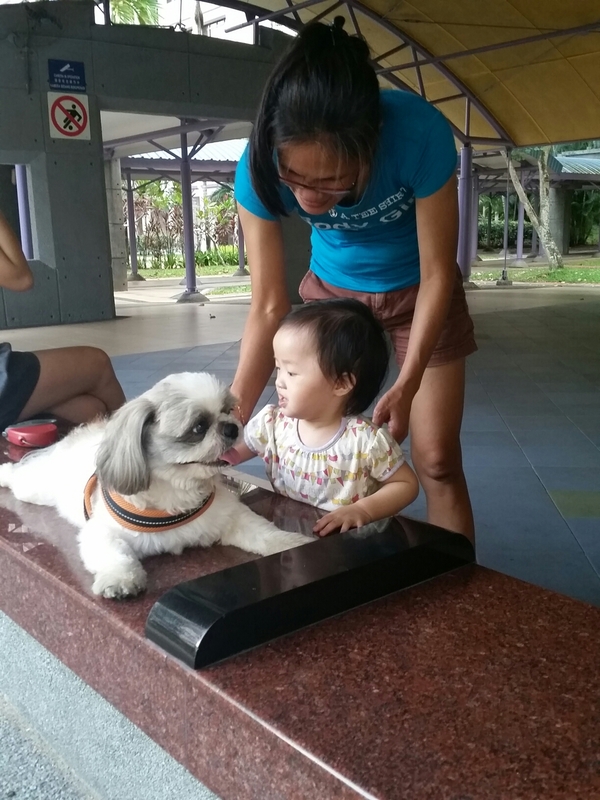 Here’s a photo of Little Foot happily stroking a friendly shih tsu in the neighbourhood yesterday evening. 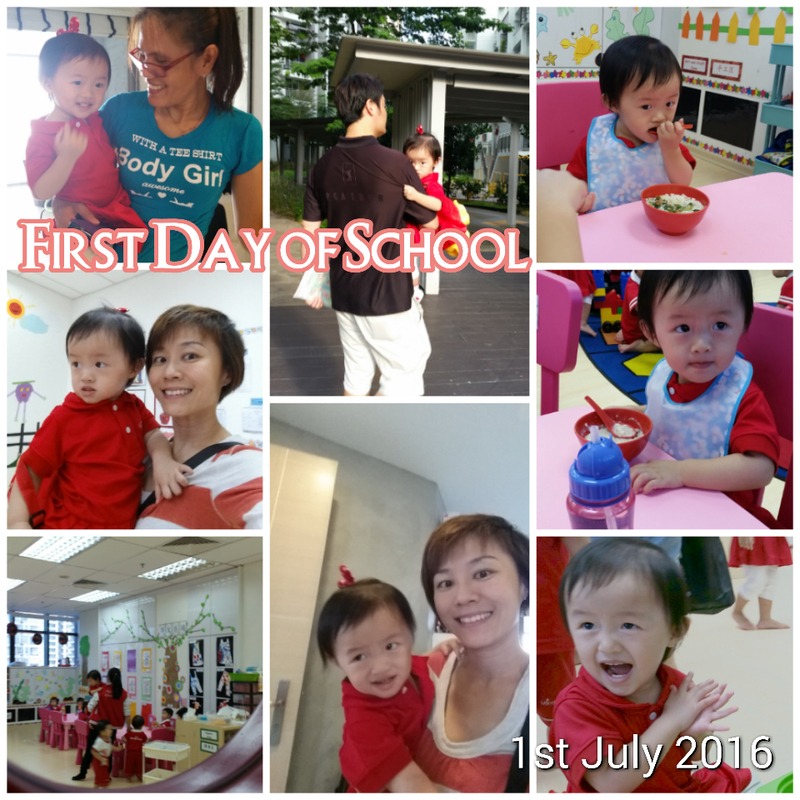 Today Little Foot formally walked through the doors of Singapore’s education system for the first time. I half expected tears, meltdowns and panic attacks from her, but I have to say she gave us a real easy time today. So we did a half – day today at the school. Observed the teachers and the class. Papa Long and I tried our best not to intervene or go to Little Foot’s rescue too much. She did well mostly, even for the part when I decided that Papa and I should exit the room. 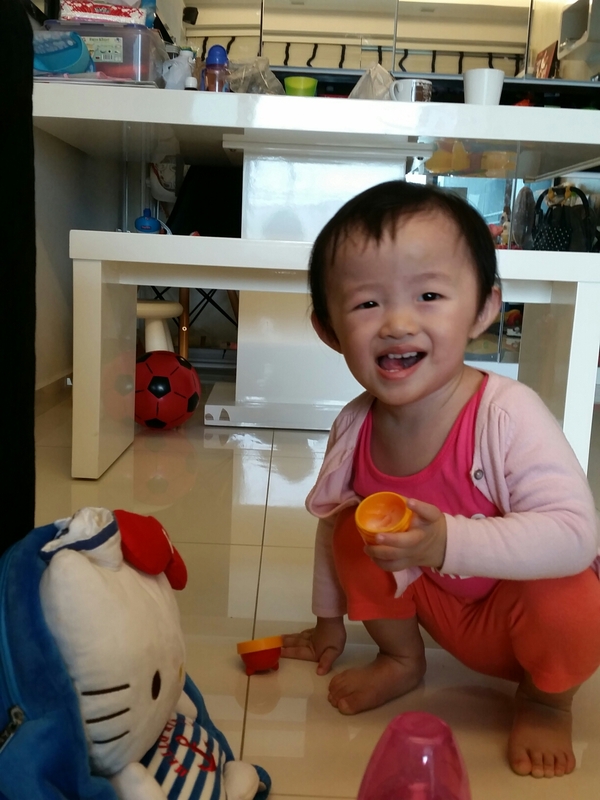 It was fruits time, and she was pacified by the rock melon treat. I also braced myself for my personal meltdown (like maybe tear or cry secretly on Papa Long’s shoulder). Haha, didn’t happen! I am quite relieved that she seemed to like the place, especially the indoor gym the the school has, and the teachers are quite kind, helping her along, teaching her the “rules” patiently. 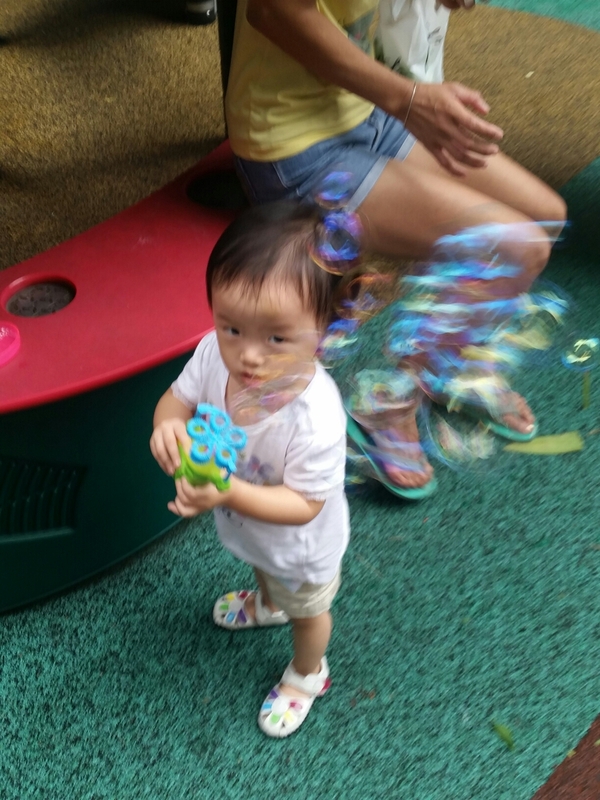 NOW as I sit in a cafe alone winding down for awhile (she’s at home napping) I look back and think of the little baby girl who made me so worried during her early days, yet she had always been a brave one, not a namby pampy whiny kind of child. I hope you adjust well my Little Foot. Sending you to school is because we love you and want to pave a smoother road ahead for you… not because we have grown tired of you and want to offload you. And we hope you will have fun in the process. Thanks for being brave and fearless. Thanks for making it easy for Mummy today. I promise that as you enter the education system, I will refrain from caving into the pressures around us. 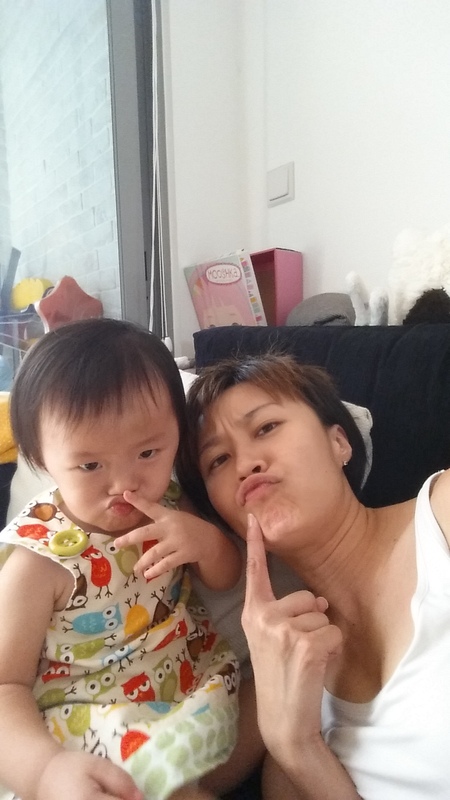 Grow and learn well, my baby, and most of all, learn good values, positivism and be kind to others.